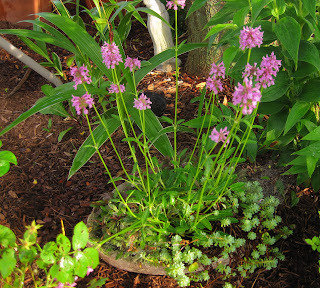 I have two varieties of betony, Stachys officinalis, in my garden. There is 'Hummelo', which has finished blooming now, or pretty much so. Then there is 'Nana', growing in a little miniature garden setting. 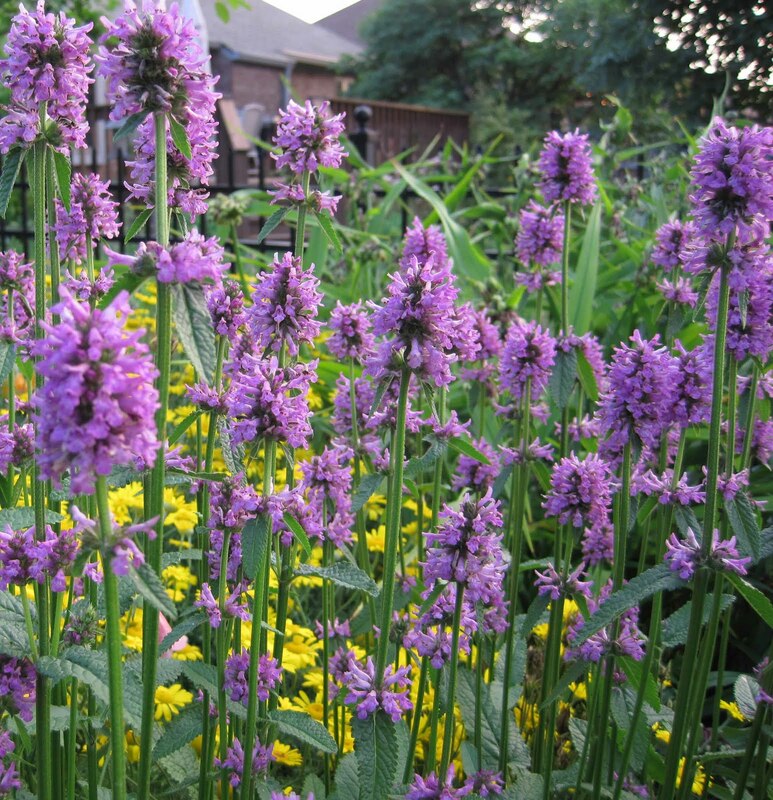 Ancient herbalist thought betony was "effective against sorcery". I've never heard of anyone looking for something "effective against sorcery". Later it was planted in churchyards to prevent the activity of ghosts. 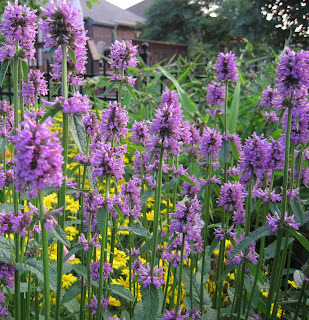 Suddenly, it feels safer to go out into the garden at night, now that I have betony, Stachys officinalis, two kinds, growing in my garden. I fear not those ghosts or anyone who might try to practice sorcery out there. Plus, modern herbalist prescribe betony to cure anxiety. This is such an easy plant to grow, that I bet just growing it would cure some "horto anxiety" in the garden. Thanks for the photos! This is blooming in public gardens in Downtown Manhattan, and I had no idea what it was. Other than something in the Lamiaceae, Mint Family. It is a beautiful specimen! I have not attempted this one. Perhaps if it does ward off evil things I shall give it a whirl. Oh, I need some of this. I'm convinced my neighbor is a warlock. Unfortunately, he's convinced, as well. Hmmm...new plant to me. I like ! Haven't visited in awhile...love your new Blog layout. I wish I could grow it to ward off those 'evil eyes' which caused such a havoc in my garden when I was away on a holiday! When I think of Stachys, I think of lamb's ears. Didn't realize that betony was of the same family. Thanks, Carol. This is a keeper. Love this little bit of history. Imagine thinking a little flowering plant could protect against sorcery or prevent ghost activities. I wonder who is was that came up with these ideas. Fascinating. Thanks for posting this, Carol. I have both colors of this plant, too. I posted the pink one recently, and when I did a search to see if I could find its name, I couldn't find it. Oh, and I love your blog template. It was a close second to the one I decided to go with. I'm trying 'Hummelo' this year too in So.Calif. and your photo of those upright spears is just what I'm after. No bloom from mine yet, just planted in spring, but was hoping for a couple months of bloom from them. Maybe that's overly optimistic.